Infinity™ Massage Chairs will expand its partnership with Brookstone® in the coming months by introducing its product line at more of the retailer’s locations throughout the U.S. The Infinity Riage X3, now available at select Brookstone stores and Brookstone.com. Between the expansion into more Brookstone locations and the introduction of the Riage X3, we expect some major growth in the next several months. Infinity™ Massage Chairs will expand their partnership with Brookstone® in the coming months as they make their chairs available at more of the specialty retailer’s U.S. locations. The massage chair manufacturer has also begun introducing its new and improved Infinity Riage X3™ Massage Chair at select Brookstone stores nationwide. In the little less than two years of their joint venture, Infinity and Brookstone have already enjoyed significant success in the way of customer satisfaction and sales with the Infinity Riage™. Over the next few months, customers will be able to test the Riage X3 in select Brookstone stores. The chair will also be available online at http://www.brookstone.com and Brookstone® will remain the sole reseller of this popular Infinity massage chair. The upgraded Riage X3 features the most advanced 3D technology on the market. This allows users to adjust the depth of the massage rollers from a gentle massage to a powerful deep tissue massage. With three 3D auto programs, this Infinity chair is easy to use and offers something for everyone. Additionally, the Riage X3 is equipped with a re-designed remote that is slimmer and more user-friendly. Finally, the massage chair’s coinciding mobile app has been adjusted to include the 3D features and is available for both Android® and Apple® device users. To top it all off, Infinity has kept the standby features of the original Riage. Users will still enjoy the 49-inch L-shaped roller track, zero gravity positions, a unique rubbing technique, and powerful reflexology massage in each foot unit. The Riage X3 has also maintained its sleek and sophisticated look that suits any home. Brookstone is a nationwide specialty retailer offering an assortment of unique and functional consumer products that are not widely available from other retailers. The merchandiser values quality in its products, service, and people. Infinity Massage Chairs’ partnership with Brookstone is a natural fit, with both companies striving for the best customer experience possible. Infinity Massage Chairs has led the massage chair industry since 2009. 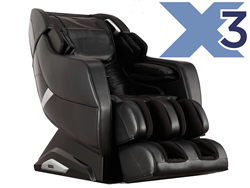 The manufacturer of luxury massage chairs continues to expand its product line, never settling when it comes to providing the utmost comfort and relaxation. Infinity aims to improve the overall mental and physical wellness of its customers, while providing top-notch customer service. The new Infinity Riage X3 is available at select Brookstone stores and online at Brookstone.com.